Whiteley - "The Balcony 2"
From a painting perspective, Ultramarine is my least used blue yet it's in my palette just the same because it's currently my only cool blue. I know maaaaany painters love this pigment but it definitely doesn't grab me the same way! I almost always opt for Cobalt instead; eventually I'd like to replace PV29 (ultramarine) with PB60 (indigo) which is much darker, though I'll probably still have a tube of ultramarine because I use it to pre-mix my preferred gray. From a fashion perspective, I don't really wear this shade of vivid blue so instead I decided to focus on the colors that give me the same feeling Whiteley describes. Color 1: Vivid red-orange. I will stop and check ANY item in this color, regardless of style or cut or fabrication, because it is my moooooost favorite. I did a quick count and found that roughly 10% of my wardrobe is this color or slight variation of (!). This color is tops for me regardless of season or trends and I don't expect that to ever change. Color 2: Pale pink. This is my current trendy color crush. I've bought way too many pink things this season! Quick check clocks this color in at around 6-8% of wardrobe (yeesh, that happened quickly). I don't know if this will pass in time but it's been building for a while now, so it might end up sticking long term along with the orange. And yet.... Today was too warm to wear either outfit and so I ended up with a deep blue just the same. I guess there's always room in the palette for Ultramarine ;) This deeper, darker shade of blue is more up my alley (it's a bit darker than in my photos) and I was very happy and comfortable in this new dress. I will definitely be wearing the other two outfits on cooler days, though! All gorgeous, which is to be expected given your artist’s eye for colour. 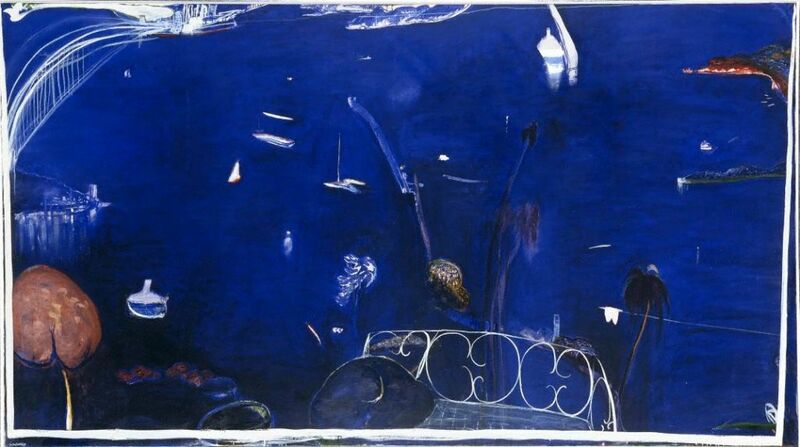 I love the blue dress as it captures the light in the way that Brett Whiteley’s painting does. Each outfit is lovely. The orange is so striking- I’m sure Angie would love it too! Thanks for sharing your thought process. I’m a bit of a painter too, this is my third year at it so still a beginner really. I’m drawn to using a lot of soft pink and green together- it’s kind of soothing and exciting to look at simultaneously lol. You are super cute Aida. That's a great way to think about the feelings behind your art appreciation. I just adore those blues so that painting spoke to me. I like the outfit proportions of the pink top over the pink dress. Both of those pieces have expected things which might be paired with them, instead by putting them together the combination you chose is unexpected. Yet it doesn’t come across as quirky or bulky, which is how I’d imagine it in my mind. Instead it’s got a very fresh “just walked out into a May flower garden and caught a warm breeze.” So for me, it’s the breezy feeling of boats strewn about on the water in the harbor that gets captured from the painting in that outfit. Thanks for sharing what the painter said, and how you used that for inspiration. I like all 3 outfits, and knowing your thought process. More love for all three outfits. The third really captures the painting for me. The print of the dress has a wave-like water motion. I share your love for red-orange and covet #1. The second outfit is happy but delicate. I can feel that in the painting. Gorgeous outfits!!! Same as for Joy, the third outfit really captures the painting for me. The waves, the colours and the flowy fabric remind me of the waters. I love the other outfits too, especially the red/orange with the light scarf - so beautiful. How fun you felt inspired to pull up your paints back out - what a success of the challenge! You paint! That explains a lot. No wonder you are so adept with colour. These all look very summer in Sydney to me, which is true to the spirit of the painting. I particularly love the monochrome outfits (1 and 2). Wow, the colour is just intense (even though pale in no 2). YLF! I love your way of explaining your colors. I totally get the substitution of the orange outfit for the color effect of the blue - great description! You look great in all of these. I like all three outfits but I adore 1 and think that in your reasoning it most captures the intensity of the painting (with the scarf and shoes lightening the mood). You look soo good in that shade, no wonder you stocked up! 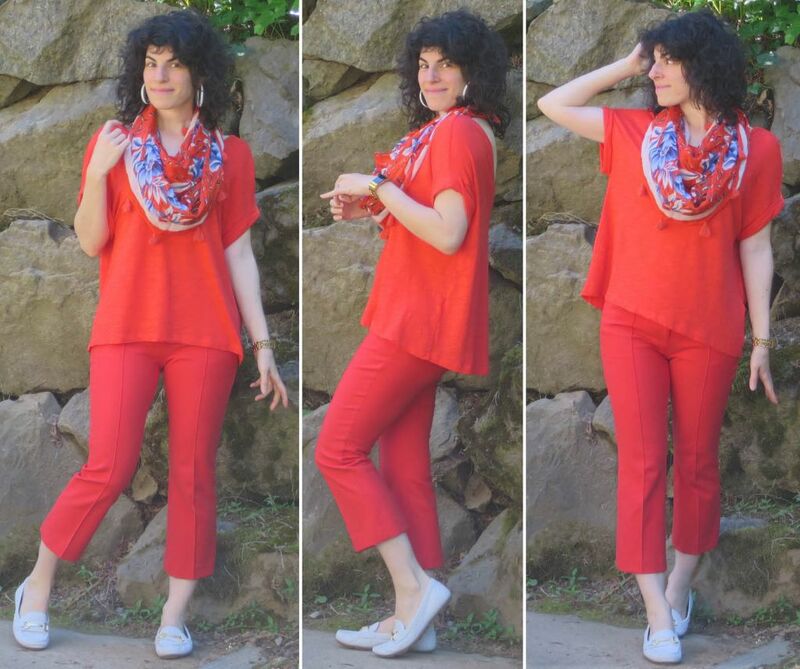 I like all 3, but am super partial to the red outfit. I can see why you love this color - it loves you back. Love the furry pom and the pretty scarf really makes the whole outfit. I usually focus on and enjoy the pictures. BUT your post was so interesting. I read and re-read your post to absorb the words and understand your thought process. I bow to you. Although I LOVE all three ensembles, that pink takes my breath away. It is stunning. More love for all three outfits. The dress is fantastic on you. I also love red with beautiful scarf. Thanks for sharing your thoughts Aida and I am delighted that you are feeling more inspired re your painting. I adore your first look and that is a colour that speaks to me strongly too. You look so alive and energetic in this colour which is the feeling from the Sydney Harbour Whiteley painting. 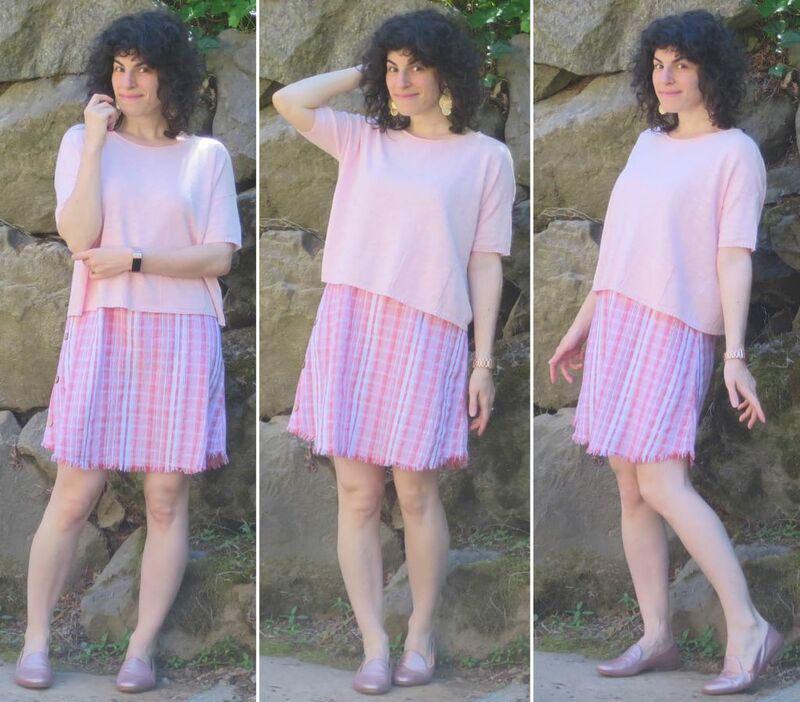 The cool summer dress is also gorgeous and perfect for a hot day. You did a wonderful job evoking the feeling of the Whiteley painting. You had me at that glorious orange outfit, which is my favorite color. You look smashing, Aida! All of the outfits are great, and I confess, I just lemming’d you with that dress, which is currently half price at Macy’s at $24.75. Thanks for sharing. Kate, oooh fun! I hope you love it as much as I do. If it came in another pattern I would be very tempted to double up. No wonder that orangey red is a favorite. It is the perfect color for you although somehow you manage to look good in everything. How do you do that? I'm surprised at how much I like the pastel dress with the topper. It doesn't seem like it would be flattering but it definitely works on you. Must be the shorter curved hem adding structure? LOVE the dress. #dressgoals! Love, love, love all three interpretations of the pairing, my favorite is # 1, bit all three outfits are gorgeous. The way you wear color is stellar. Aida, the dress just came, and I love it. Definitely a keeper. Bought two sizes, since I wasn't sure how it would fit, but my normal medium did the job just fine. A perfect dress for our hot humid summers. Thanks so much for posting it! I love the way you used the colors that give you that same feeling to create your own look, even if it deviated from the actual painting colors. That vivid red-orange loves you back! It is a stunning color on you. Thanks for the lovely comments, ladies! Kelly, I would also highly recommend the blue dress (as I did above for Kate!). I think it'd work really well for you, seems to run TTS or maybe just a little large. Gosh! How did I miss this edition of the Art challenge! Love them - each and every outfit. The orange outfit, especially, has *exactly* the same feel to me as the painting. So fascinating that colors opposite on the color wheel can have the same effect. I wonder if it’s something about the depth and saturation of the shade of orange you have chosen. KILLER x3. I love it all, Aida. Thanks Sarah! I think it definitely has something to do with the intense color of the orange. I would guess, on the right person, any vividly bright saturated color could do the same. Being opposite on the color wheel probably doesn't hurt either, gives it an immediate visual link. I want those sandals in a 6.5 N! 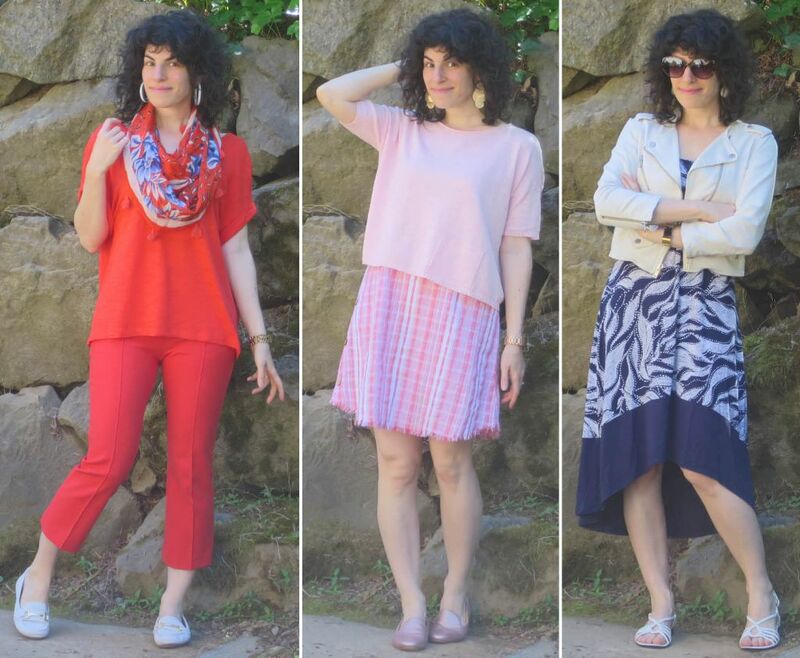 These are all such fun looks, and it’s hard to pick a favorite. I do like the third one in particular, but I’m always a sucker for blue. I’m also planning to wear a very similar outfit this week, which adds to my partiality.